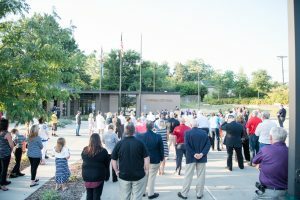 The City of Norwalk welcomed a delegation from its sister city, Vushtrri, Kosovo and military officials for a series of events in the Des Moines Metro Area. This is Vushtrri’s first Sister City visit to Norwalk. The events included a Law Enforcement Academy tour and welcome reception at Camp Dodge, tours of locally-owned businesses in the Norwalk community, and an official flag raising ceremony after a Norwalk City Council meeting with a performance by the Iowa National Guard Band members’ quintet. 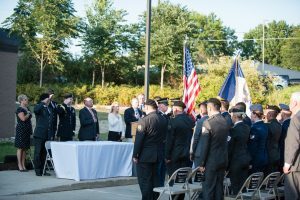 Immediately following the flag raising ceremony, a public reception with fireworks and performances was held at Warrior Run Golf Course. The relationship between Iowa and Kosovo began in 2011 with a partnership between the Iowa National Guard and the Kosovo Security Force. This visit expanded the partnership by establishing global trade opportunities. By fostering these relationships, Norwalk companies will assist the rebuilding of the war-torn city. Other initiatives include trade opportunities, agri-tech skills, police and public safety programming, and cultural exchanges among students in our school district-all during their weeklong visit. Throughout their visit to Norwalk, the Vushtrri delegation visited Norwalk Schools buildings, touring the 6-12 campus’ renovation projects and meeting with students from Lakewood at Lakewood Elementary. With this developing partnership, students in our district will eventually have the opportunity to develop pen pals as part of our World History curriculum, Skype with Vushtrri students or travel for a weeklong camp to Kosovo for a cultural immersion experience. On the last evening of their visit, a group of Oviatt students opened the final public ceremony at Norwalk City Hall with a recitation of the Pledge of Allegiance. The Kosovo delegation Vushtrri’s Mayor Xhafer Tahiri, Members of Kosovo’s Security Force, Iowa National Guard members, representatives from Iowa Sister States and the Consul General of the Kosovo Consulate were all in attendance alongside members of Norwalk’s fire and police departments, Norwalk City Council members and Norwalk residents. 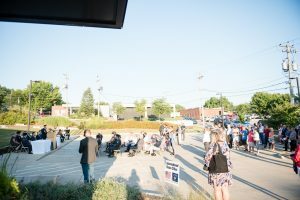 The City of Norwalk is excited about this developing economic, educational, and cultural connection.